Baldwin & Phillips Construction brings together 40+ years of construction experience. Our specialties are high end log, timber frame & craftsman style homes. Located in Sylva, North Carolina, in the beautiful Smoky Mountains. Baldwin & Phillips Construction offers turn key construction solutions, including homesite selection, estimating, and construction of your home in Haywood or Jackson County North Carolina or the surrounding areas. Together we can provide a unique construction experience, master craftsmanship, and a quality home that will be reflective of your personality and a place of comfort and refuge for generations. We can help you create a truly unique one of a kind home. We endeavor to match your living requirements and design ideas with our construction knowledge to create a home that fits your lifestyle and budget. Mr. Baldwin is a full scale unlimited North Carolina general contractor. He brings years of experience in construction management and design. His experience includes everything from the design/build of custom homes to the construction of a “high end log community” with homes ranging from 3000 – 6000 square feet. 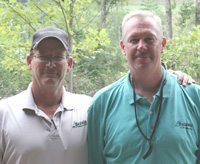 He has also served as a director on the Haywood County Homebuilders Association. His ability to manage all aspects of the construction project is unsurpassed. Mr. Phillips, also a North Carolina licensed contractor, is one of the most talented and knowledgeable builders in the area. He brings practical construction knowledge to Baldwin & Phillips Construction, having performed many of the jobs that are now performed by the workers he manages. With many years of construction experience, he oversees all projects and is able to stay on top of the construction process, providing a quality home in a timely and professional manner. Larry is a past director of the Haywood County Home Builders Association.